Philippi residents who were taken for questioning after going to look at the scene of a shoot-out which left one policeman dead and two wounded on Sunday night allege that they were beaten by police before being released with no charges laid. In a statement police spokesperson Bernadine Steyn said three police members who were taking part in a routine crime operation in the area, approached a stationary red Mazda with four occupants on Sikhawilimanzi Street at about 11pm. The occupants of the vehicle opened fire, killing reserve constable Bulelani Ndita, 29, and wounding a detective constable and a “senior officer” who were not named in the statement. But the gunshots attracted a crowd of about 50 people to the scene, 14 of whom were forced by police arriving on the scene into the back of police vehicles and driven to Philippi East police station for questioning. Those who were detained say they were subjected to brutal beatings at the hands of the police before being released during the early hours of Monday morning. One of those detained, Lulamile Loliwe, 23, said he went to the scene of the crime about an hour after he heard the gunshots. With his face bruised and swollen, Loliwe said “about 50” onlookers were at the scene, standing at the edge of an area cordoned off by police who were searching for evidence. He said while he was there more police arrived and starting shouting at him and a group of young men he was with, asking them “where are your friends”? He said when they replied they knew nothing of the crime; they were assaulted and he and 13 others dragged into three police vehicles. At the police station they were split into groups of three and put into separate cells. There, he said, they were beaten by “about three” police officers who used their fists and feet to batter the suspects. He said his jaw was incredibly painful and he suspected it may have been broken, and was planning to lay a charge of assault against the police officers. Another of the detainees, Andile Mfazwe, 24, said he suspects the reason police chose them of the many people at the scene, was because they are men. Mfazwe said he had no problem being questioned by the police but “we were not supposed to have been beaten and kicked “like dogs”. 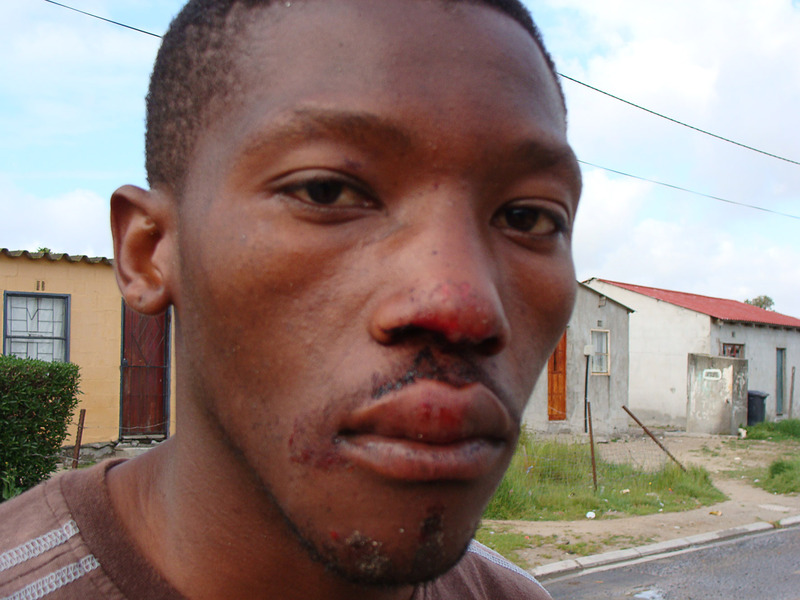 “I am sad to have been beaten like this, especially by law enforcers. It makes me sick. After the release we were not even allowed to go the charge office to lay charges, because they knew what they were doing was against the law,” Mfazwe said. * Reporting by Sandiso Phaliso. Published in the Cape Argus, 21 October 2008.